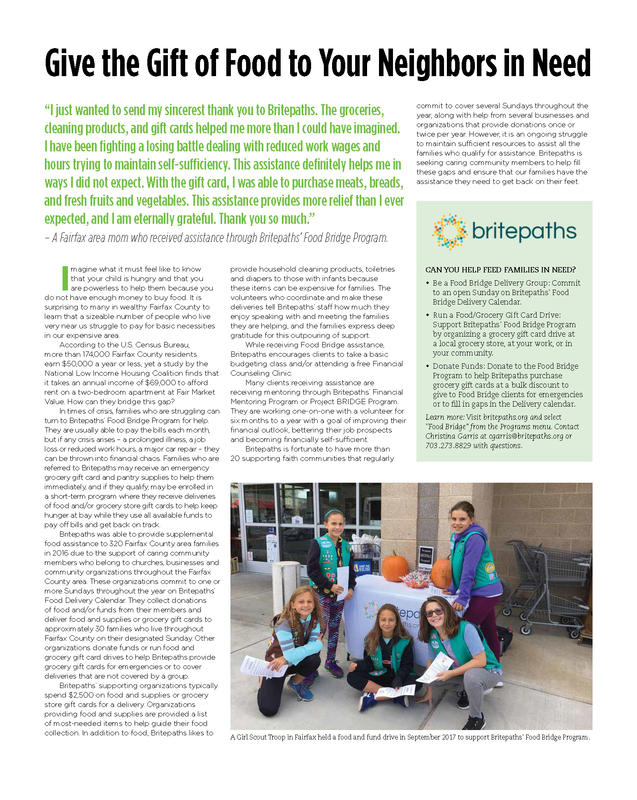 The November-December 2017 issue of Fairfax Woman Magazine turns the spotlight on Britepaths' Food Bridge Program. In times of crisis, families who are struggling can turn to Britepaths’ Food Bridge Program for help. Britepaths is fortunate to have more than 20 supporting faith communities that regularly commit to cover several Sundays throughout the year, along with help from several businesses and organizations that provide donations once or twice per year. However, it is an ongoing struggle to maintain sufficient resources to assist all the families who qualify for assistance. Britepaths is seeking caring community members to help fill these gaps and ensure that our families have the assistance they need to get back on their feet. Can You Help Your Hungry Neighors?